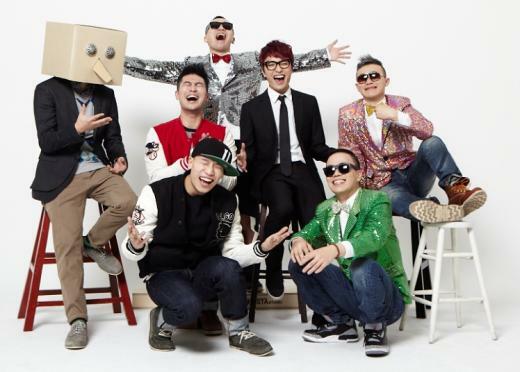 Amoeba Culture artists Dynamic Duo, Simon D, Primary, and Rhythm Power have met together for a poster photo-shoot for “2012 Amoeba-hood Concert” which will be held on January 27, 28 at Olympic Park’s Olympic Hall next year. “2012 Amoeba-hood Concert” will also be held in Daegu (February 4, 2012) and Pusan (February 11, 2012). Meanwhile, Dynamic Duo and Simon D will appear on KBS “Immortal Song 2” on December 24 at 6:15PM KST. This entry was posted in Miscellaneous and tagged amoeba culture, amoebahood concert, Dynamic Duo, immortal song 2, primary, rhythm power, simon d. Bookmark the permalink.